Anaplasmosis is a blood-borne disease of cattle caused by the pathogen Anaplasma marginale. This pathogen is transmitted in North America by the Rocky Mountain wood tick (Dermacentor andersoni) and the American dog tick (Dermacentor variabilis).The Rocky Mountain wood tick is found In western Saskatchewan to central British Colombia. The American dog tick is found from Saskatchewan east but appears to have undergone a range expansion according to historic record. Currently there is little information on some of the most critical factors that determine the risk of anaplasmosis transmission. Calgary, AB – The growing global demand for protein has presented Canada’s beef industry with an unprecedented opportunity to increase demand for its beef products. The ability of industry to fully seize this opportunity is not without significant challenges; tight cattle supplies, reduced marketings, and competition for arable land are among the factors to be overcome. Canada’s beef sector organizations have responded to the challenge with the creation of the National Beef Strategy. A collaborative effort of national and provincial beef sector organizations, the National Beef Strategy provides the framework for how the organizations can work together to best position the Canadian beef industry for greater profitability, growth and continued production of a high quality beef product of choice in the world. Prebiotics are nutrient sources that favor the growth of beneficial bacteria within the host animal, while probiotics are live cultures of bacteria that are fed to improve digestive system health. Using a combination of probiotic and prebiotic strategies to achieve a healthy outcome is referred to as synbiotics. There is some evidence that suggests that the use probiotics and prebiotics may improve the health of monogastrics, but their potential benefits for ruminants are not well understood. Short- and long-term outcomes of these treatments for ruminant productivity, metabolic efficiency, feed digestibility and food safety have not yet been assessed. The Beef Cattle Research Council (BCRC) is Canada’s industry-led funding agency for beef research. Its mandate is to determine research and development priorities for the Canadian beef cattle industry and to administer National Check-off funds allocated to research. 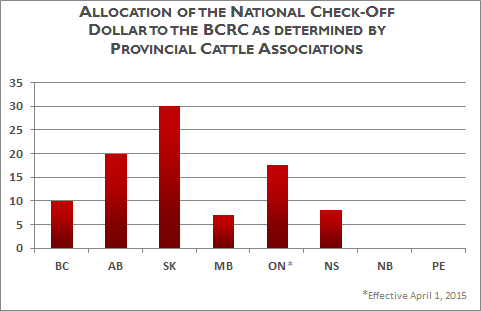 The BCRC is led by a committee of beef producers who proportionally represent each province’s research allocation of the National Check-off. On average nationally, the BCRC receives approximately 16% of the National Check-off, and plays a key role in leveraging additional funding for beef, cattle and forage research. Recognizing this, the Council works to ensure the highest return on investment possible for industry contributions to research through ongoing consultation with other provincial and national funding organizations.